Miami residents are well aware of the presence of street art. It's a part of our lives--you can't drive downtown or through Wynwood without seeing some amazing art using a building's walls as its canvas. And now that Art Basel is over, many of Miami's walls have an entirely new aesthetic. 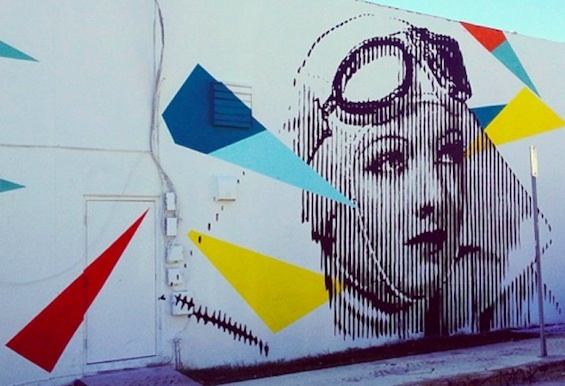 So on Dec. 13, street art will be celebrated with MIA Walls. The event, created by MIA Sessions, will celebrate the city's street art community by allowing art lovers to have an evening audience with four of Miami's most talented artists, 2Alas, Mr Herget, Evoca1, and Jose Mertz. The artists will share their work as well as field questions from the audience, discuss their influences and talk about upcoming projects. MIA Sessions, co-founded by Diego Guevara, Jaime Dussan, and Juan Muñoz, is an organization dedicated to fostering a well-knit art community. According to Guevara, the organization was "created with the purpose of building a stronger and more involved creative community by organizing quality and inspiring events around Miami, featuring well-known artists, panels, lectures, and workshops." "We are working closely with some well-known experts in different industries to offer Miami the quality of events we, as professionals in the creative field, have been craving for some time," wrote Guevara in an email interview. "MIA Walls is our first official event and it celebrates the beauty and impact of Miami's street art." Street art, Guevara says, is important to Miami for many reasons. "[P]erhaps the most important [reason] has to be the direct connection between the art, the artist, and the city," he said. "We are very fortunate to have incredibly talented local artists working on amazing projects right in our backyard, and to experience the process and work behind each one of their murals that we later get to enjoy, photograph, and share with the world." Another reason street art is popular in Miami is its availability. Locals don't have to go into an art gallery to view great works; they can just go downtown. "Street art is free and accessible to the masses. At least that is the general perception and what I believe attracts so many people," wrote Guevara. "People can relate to most of these great artists and truly appreciate and value their work. Being able to meet, talk to the artists, see them work, and witness the final project first-hand creates a sense of connection and makes us feel like we are part of it, just like these walls are part of us and Miami." MIA Walls may be MIA Sessions' brainchild, but they aren't the only ones who are excited about this event. MIA Walls is being sponsored by LMNT, Perrier, Red Bull, Deep Eddy Vodka, Miami Ad School, Thee Blog, Squarespace and Nativo, and they'll provide guests with complimentary treats. "We are working closely with them to make sure MIA Walls is a successful event and the first of many to come," wrote Guevara. MIA Walls will take place at LMNT (59 NW 36th St., Miami) at 8 p.m. Friday. Visit miasessions.com.